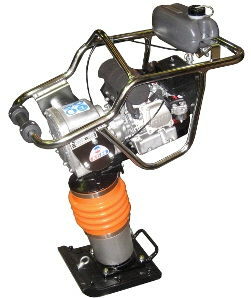 NO oil mixture means the Belle Group Rammer RT-66 4 HP Honda GX120 Rammer is quick and easy to start. Ideal for trench fill compaction. Engine Specifications: 4 hp, 4-stroke Honda Gasoline. Travel Speed: 45' per minute. 11" x 13" ramming shoe size. Well-balanced design makes for smooth operation and easy control. * Please call us for any questions on our compactor jumping jack rentals in Cedar Rapids IA, Iowa City, Mt. Vernon, Marion, Hiawatha, and eastern Iowa.